Fans were barred from the game because officials feared for their safety in the wake of Baltimore-area riots in protest over the death of Freddie Gray, a 25-year-old African American man who died in police custody. While barring the gates at potentially dangerous games occasionally occurs at hooligan-plagued soccer stadiums around the world, it was the first time that fans have been locked out of an American professional sports event. 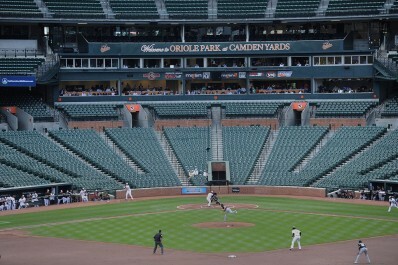 This resulted in the smallest crowd in major league baseball history—zero in paid attendance—and also surely one of its lowest moments. Indeed low it was, but not because a sporting event was ruined. Its baseness is a result of generations of human lives having been ruined by the utter failure of modern progressive liberalism, both its policies and cultural values. National Review’s Kevin Williamson makes a compelling case that “Riot-Plagued Baltimore Is a Catastrophe Entirely of the Democratic Party’s Own Making.” The Democratic Party has run that city for more than a generation, Williamson notes, and there isn’t a Republican anywhere to be found in the city’s political hierarchy, as is the case with most big cities in the United States, and where, not coincidentally, financial and social problems abound. The meme the media and liberal politicians have been pushing since Ferguson, that white, racist cops are abusing and killing innocent black victims, doesn’t work as well in Baltimore, because all the city’s leaders among both politicians and the police, including the mayor, are black. Of course, that doesn’t keep the dominant narrative in the media and among Democrats from being fundamentally about race. You may have heard the rallying cry “Black Lives Matter,” which went viral after Ferguson and another police killing in Brooklyn, both on the internet and on t-shirts and signs all over the country. That pretty much sums up the dominant assumption among the liberal intelligentsia and many black Americans: white America simply doesn’t care about black Americans, is indifferent to whether they live or die. [M]ake no mistake about it, the anger that we have seen in Ferguson, in Cleveland, in Staten Island, in North Charleston, and in the flames of Baltimore is not just about policing. It is about the legacy of race that would have us devalue black lives — whether their death is caused by a police officer or at the hand of another young black man. It is about declining wages and the lack of opportunity in our country today. It is about the brutality of an economic system that devalues human labor, human potential, and human lives. It is about the lie that we make of the American Dream when we put the needs of the most powerful wealthy few ahead of the well-being of our nation’s many. Extreme poverty is extremely dangerous. It is more than a little disconcerting that the most culturally influential forces in America today, from Democratic politicians to the media, entertainment, and education elites, tend toward rationalization and excuses rather than personal responsibility when assessing civic unrest. I am probably not the first to point that during the Great Depression many Americans, black, white, and in between, experienced a poverty that most “poor” Americans in 2015 could not imagine, yet no cities went up in flames because of it. The violence that has engulfed Baltimore is visible and heartbreaking evidence of a city that has been under siege for decades. The phrase “under siege” doesn’t exactly imply that anyone who lives in this city could be personally responsible for their actions, a pernicious thing to allow any human being to believe, yet alas, it is at the very heart of modern liberalism. “These are major issues and have been for decades, and we need to deal with them. But the bigger context is the globalization of the economy, technological change and deindustrialization. Notice how, according to the liberal worldview, people who live in these neighborhoods are somehow living in a moral vacuum where right and wrong, good and bad, and most importantly, personal responsibility, don’t seem to exist. In this conception, people are cogs in a machine, everything in their lives determined by forces outside their control or choices. It is a very sad view of the world and human nature, and diametrically opposed to the worldview on the other side of the modern political/cultural spectrum, those today labeled as conservatives and libertarians. This isn’t to deny that outside forces don’t affect people in profound ways, but it is to deny that they are helpless. The fundamental problem in the inner city today isn’t the material conditions, but as Plato might put it, the disordered soul. Virtue, and the time-tested environment in which it is best inculcated, the traditional family, are tragically all but invisible from these neighborhoods and from the discussion on the political/cultural left. The one thing that every sociological study and common sense tells us can really make a difference in the life of a young person is a stable home life. The woman who now famously saw her teenage son in mask and hoodie, dragged him out of the riots, and clocked him upside the head is a single mother with six children and no father or fathers ever mentioned in stories about her. It is heartbreaking. There are indeed forces that make raising solid, law-abiding, respectful young citizens difficult, but as this mother knows and was teaching her son, he is responsible for his behavior. A recent article titled “Epic Fail” documented the failure of every environmental disaster predicted for the last 50 years to come to pass , and this phrase resonates as one reads about the sad happenings in Baltimore. Under almost 50 years of policies and cultural manipulation meant to help allegedly vulnerable black Americans, not only have things not gotten any better, they have gotten worse. The term “Epic Fail” comes to mind as one witnesses the sad spectacle of a Major League Baseball game no fan was allowed to witness in person because the very people and policies which promised to lift up the nation’s poor have trapped them in economic and moral squalor and torn all hope from their hearts. Thanks, Pascal. Good, but sad, thoughts. In the interest of accuracy, that other police killing was in the NYC borough of Staten Island, not Brooklyn. As to your final conclusion, that was foreordained and so certainly should surprise no one. Utopia is allegedly that place where everybody is happy. Everybody? If so, where do practical jokers and misanthropes fit in there? That promise to lift up the poor — that’s the salesmen talking: the practical jokers who yearn to see the rubes fall for their traps. As for the misanthropes: they’re the ones who always ran the gulags. The fact that Baltimore’s crime rate has doubled (so far) since Freddy Gray attests to the nature of the rulers of that berg. And their national supporters are not finished. They’re coming to the city nearest you.